With Christmas 1972 fast approaching, it was perhaps not a big surprise that Chuck Berry continued to hold on to the Number 1 spot for a second week with his novelty tune, My Ding-A-Ling . Further down the listing, you can't help but notice the increasing collection of teenage heartthrobs (both contemporary and past) cramming the Top 20 - singles by the Osmond family, the Jackson family, David Cassidy and - from the 1950s and 1960s - Neil Sedaka and Chris Montez all featuring. Four new entries this week, though, meaning we said goodbye to The Carpenters , Alice Cooper , Junior Campbell and Archie Bell and the Drells . Making an impressive 19 place jump into this week's Top 20 was Blue Mink, the six-piece combo which included the likes of Madeline Bell, Roger Cook and Herbie Flowers. 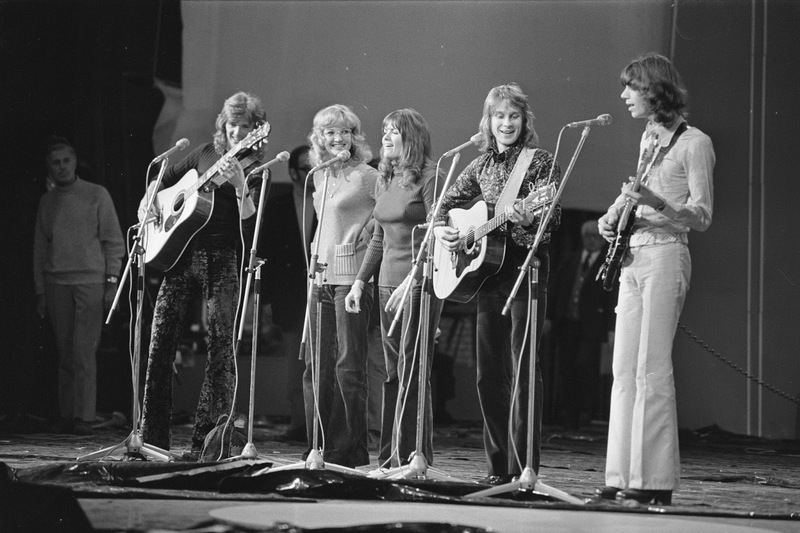 Co-written by Flowers, Stay With Me was the group's fifth consecutive Top 20 hit - a slow, melodic ballad which would eventually peak at Number 11 during an initial 15-week run on the charts. While still a major player in the Jackson 5, Michael Jackson's solo had taken off with singles such as Got to Be There and Ain't No Sunshine . However, it was a song originally intended for Donny Osmond which took Jackson to the top of the charts in the USA and into the UK Top 10 for the fourth consecutive time. Ben was the title song to the movie of the same name , a horror film about a young boy and his pet rat.It was nominated for an Oscar in 1973 for Best Original Song (losing out to Maureen McGovern's The Morning After ), but won a Golden Globe for Best Song. In the UK, the single would eventually peak at Number 7. By this time, David Cassidy's chart career was faring much better in the UK than it was in his homeland. His heartthrob status, passionately nurtured by his British fans, almost inevitably guaranteed him a high placing on the hit parade. This time, the sales for Rock Me Baby were not quite as enthusiastic as they had been for his previous two solo singles - probably due to the fact that it was the title track to his latest album and that it was not the syrupy ballad that fans had come to expect from him. The track was uptempo, trying to be more rock'n'roll and less middle of the road, but Cassidy's vocals - while good - did not really suit this type of song. Consequently, it peaked at a lower Number 11 in the UK and proved to be his final US Top 40 hit (No.38) of the 1970s. In a year full of re-releases, it was Neil Sedaka's turn to return to the British charts bringing Oh! Carol back into the listing for the first time since it peaked at Number 3 in 1959/60. One of the main reasons for its reappearance was because of RCA's MAXI-Million series of releases, which brought together a small collection of an artist's previous hits on one 45rpm record. While Oh! Carol was the lead track, it was backed with Breaking Up is Hard to Do (No.7, 1962) and Little Devil (No.9, 1961) - all well-known songs from Sedaka's back catalogue. It afforded him his first UK Top 40 hit in a decade, bringing him back to the British public's attention just ahead of the relaunch of his 1970s chart career. The author of this website is a participant in the Amazon Services LLC Associates Program, an affiliate advertising program designed to provide a means for sites to earn advertising fees by advertising and linking this site to Amazon properties including, but not limited to amazon.com and amazon.co.uk.